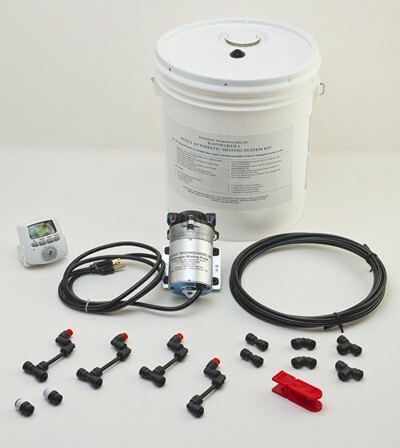 The all new quick connect Rainmaker misting system kit includes fully adjustable nozzle assemblies that can be rotated 360 degrees for complete coverage. Quick connect fittings allow for an extremely fast, effortless installation by simply cutting the tubing and inserting it into the fitting. The quick connect fittings automatically lock the tubing into place. 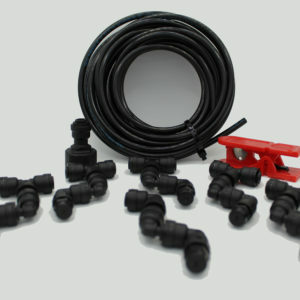 No bulky hose clamps or special tools are required making expansion of the system a breeze. 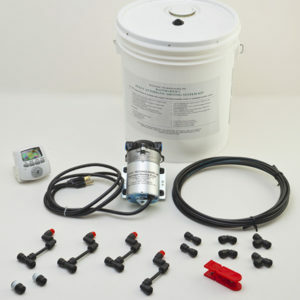 Includes our 45 PSI diaphragm misting pump. Runs dry and is designed for intermittent or continuous duty use. Mist a single enclosure or an entire greenhouse. Can be programmed to operate automatically up to 14 times per day for as little as 1 minute or as long as desired. 1/4″ O.D. hose size. 110V 50/60 HZ operation. 220V power converters available. Actual number of nozzles able to be used with this system will vary depending on many factors including type and number of nozzles used, corresponding flow rate, number and types of fittings, etc. But normally up to 35 or more of our red low low wide angle nozzles and 80+ feet of 1/4″ O.D. flexible hose can be operated on this system with no noticeable drop in performance. The same reliable performance you have come to love in an all new improved design.